This will be a little bit longer post than usual since I did not post last Sunday. So hang on to your hangers people, here we go. Today I was brave. I did something I rarely ever do. I tucked my shirt in. I know this might sound ludicrous to most of you but for those of us shaped like a cake pop (or an apple if your old school) we do anything NOT to bring attention to the fluffiest parts of ourselves. That would be our nonexistent waistline. Therefore we do not tuck in our shirts. We opt for flowy, soft pieces that glide over all the lumps and bumps giving the illusion of a waistline. We belt dresses and blouses at the upper waistline or empire style to give us a waistline where none exists. 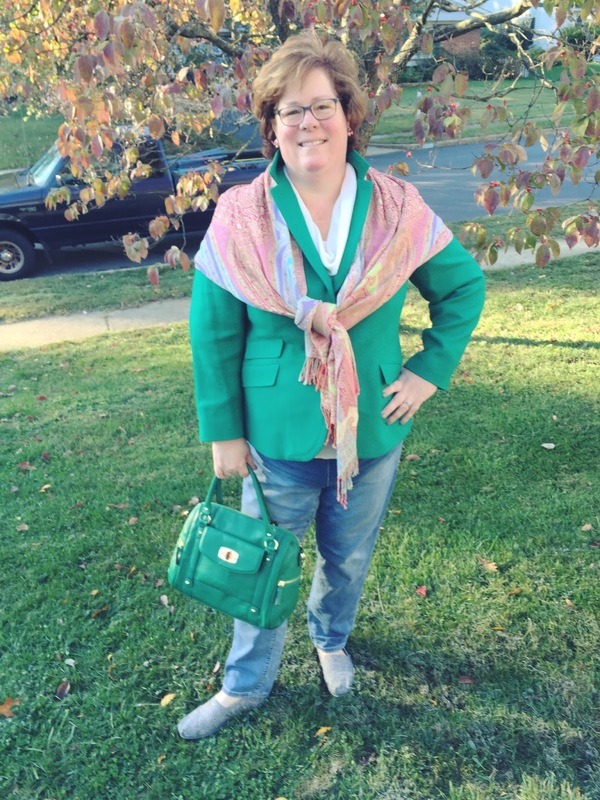 The blouse and cardigan are from Lands End, shoes Payless, slacks Dress Barn. Now I feel like doing 100 million leg lifts so that I can get that lower belly in shape. Oy to the vey! When you have held as much weight as I have for as long as I have, this area of the body is the toughest nut to crack. It doesn’t help that I carried my babies low and in front either. This is not to say that I will not defeat this sleeping giant of a muscle group, but it will take time and I need to be gentle with myself and celebrate the fact that I tucked in my shirt. and the scarf I have had for almost a decade. Next up we have what I wore to church last week. It was a bit more casual than I usually wear which is why I put a blazer on. Here is another tip for all you plus size women out there. Get to know your local tailor. I use the own at our dry cleaners for things like dresses and blazers. I hem my own pants and skirts but when it comes to the curves, I hand it over to a professional. I have short arms, wide shoulders and a lower bust line. This usually means that I buy one size larger in blazers to fit the shoulders and then have my tailor bring in the side seams and hem the sleeves. It was worth the extra forty dollars to get a really good fit. 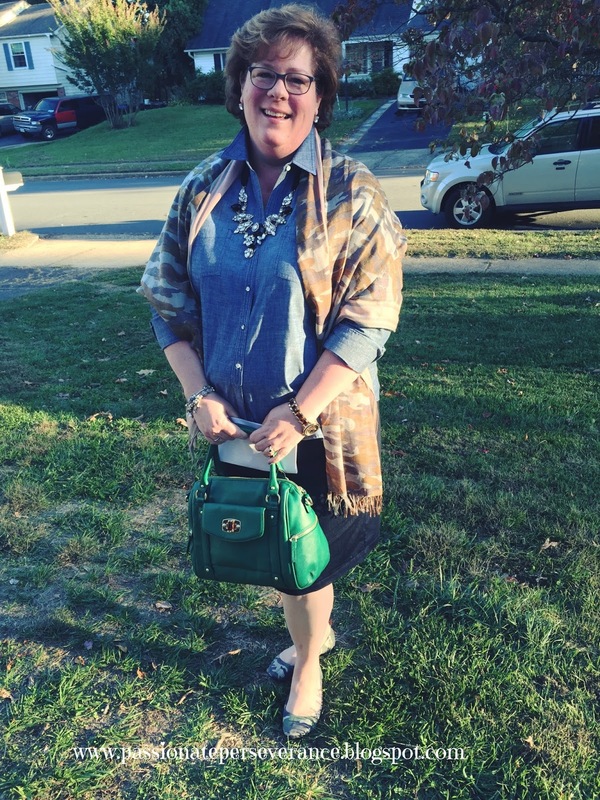 Black skirt is three years old from Lane Bryant. 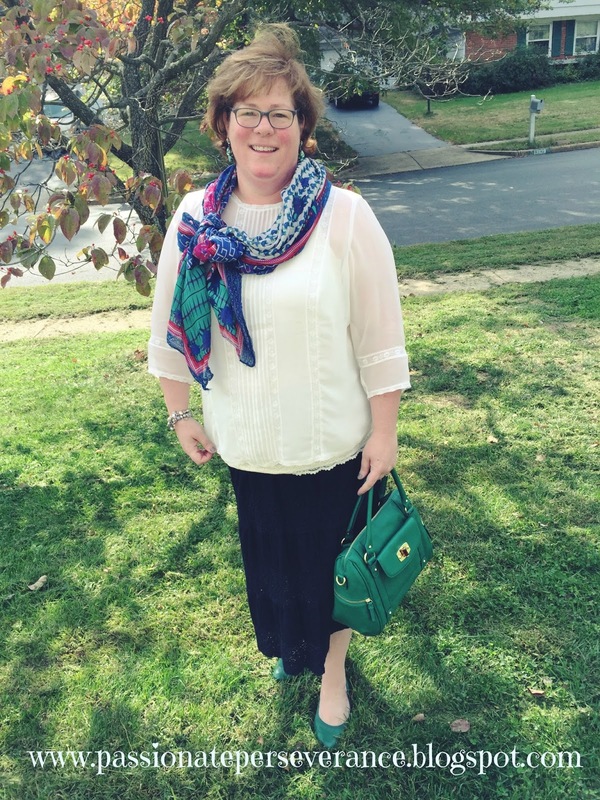 Lace top from Macy’s, Shoes from Talbot’s, purse form Target, and scarf from Charming Charlie s.
Last week I had another funeral and a speaking engagement. So for the funeral I went with a cream lace top and black skirt. Again all these pieces are from my closet and they are finally fitting again due to my recent weight loss of EIGHT POUNDS!! Slow and steady wins the race my friends. Slow and steady. For my speaking engagement, I went with denim and camouflage. 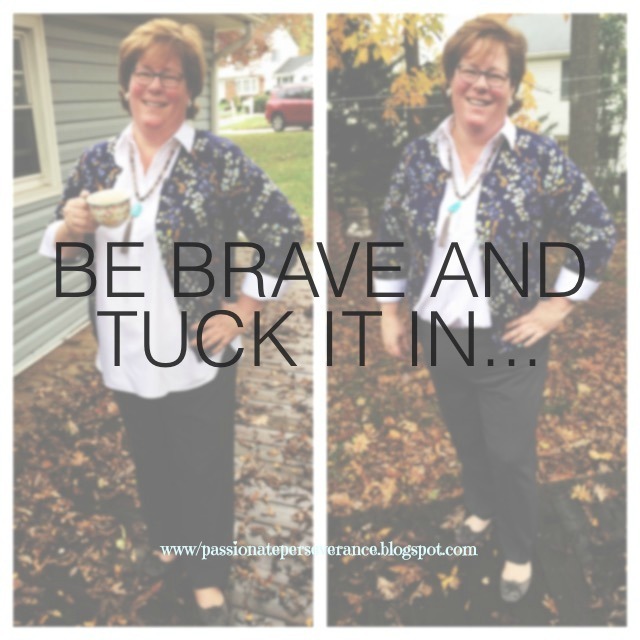 I wanted to tap into my inner warrior Mama to overcome the butterflies in my stomach. It worked. I was comfortable and I didn’t worry about what I was wearing. I was nervous enough about what I was saying. Yes, I talk with my hands. It’s an Irish thing. 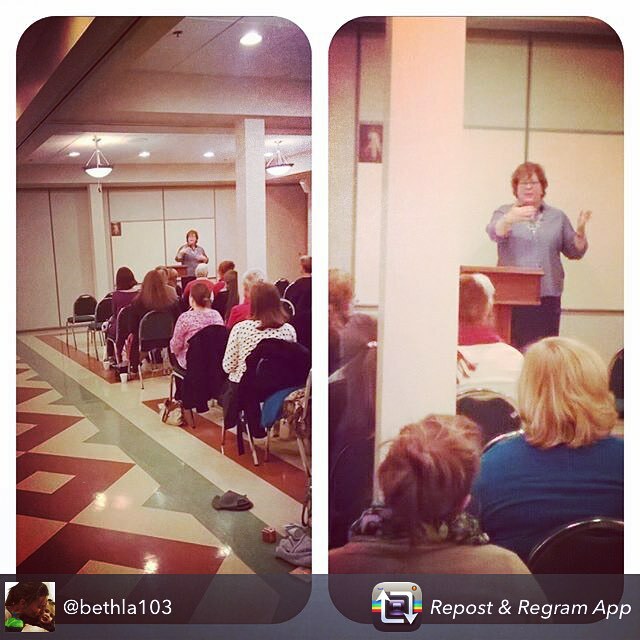 St John the Baptist Women’s Group…You’re the BEST!! Then there is this dress. I totally forgot what the occasion was but I wore it in the last two weeks, so there you go. 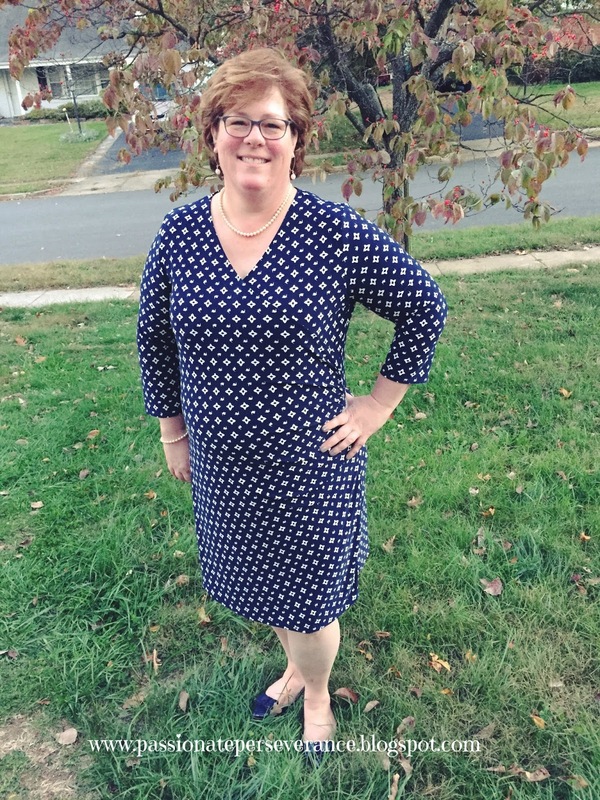 It’a a Ralph Lauren wrap dress that I have had hidden in the closet for the last two seasons. I wasn’t sure if it would actually fit but I tried it on and BOOM! it did. Thank you Whole30ish! There you have it frends. 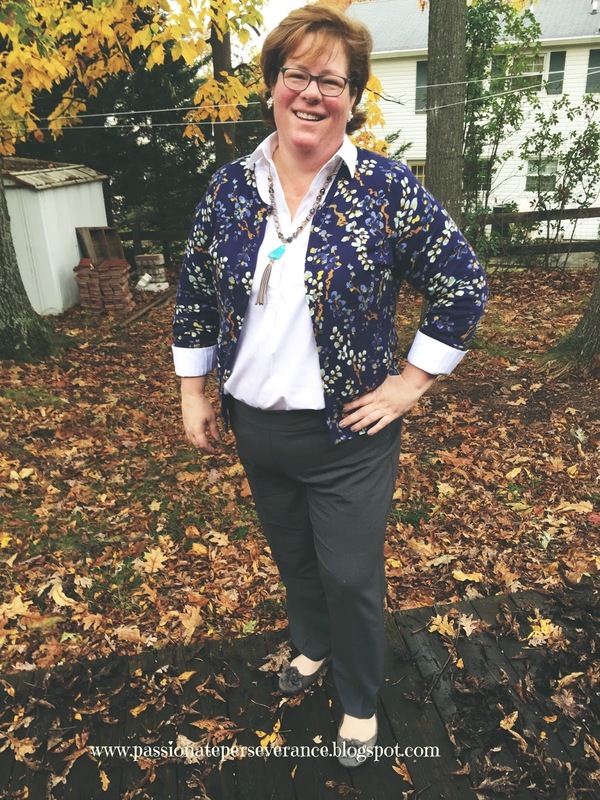 Another peek into my style and fashion brain in regards to dressing and looking your best no matter what your size or body image phobia. Remember that most people don’t even notice what you are wearing especially when you great then with a smile and a warm heart. THAT is what stays with them. Now if you dress like Elvira, I am not sure a smile or warm heart will outdo that particular look, but you can try. Until next Sunday…stay classy and sassy. You are rocking it Mary! First of all, you are beautiful. I love coming across women who are filled with the Holy Spirit because they are just warm and cheery and I want to have coffee with them. YOU are one of those women! Size doesn't determine how much love you can hold in your heart. And here here for pushing through on your Whole30! It is rough! But it's so worth it and clean eating will change your life! This is my first time on your blog but I will bookmark and keep watching your journey. Welcome Sterling!! Thanks so much for all your kind words! Looking great! 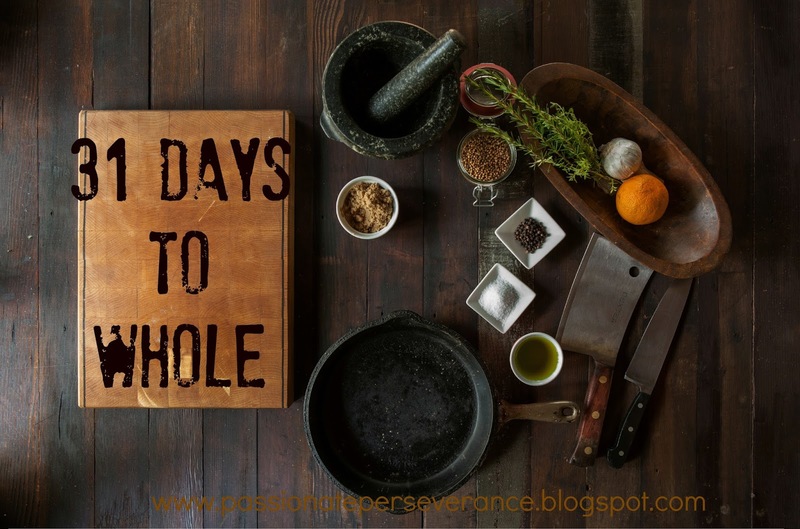 That's a great reason to stick with the Whole30 more than 30 days—along with the fact that cheats make you feel awful. I'm telling myself, and everyone else, that the diet does NOT end on October 31. Can you think of a worse day to end a diet? Okay, 3 or 4: Thanksgiving, Christmas, Easter, New Years…. I agree. It is a new beginning. Now to take on the holidays and NOT gain an extra ten pounds! I know I can do it. Congratulations on your success with weight loss! That's fantastic! I am in the same boat as you are. After many years of carrying around way too much weight, I have finally started taking care of myself. Like you, my abs are the hardest part to get rid of. "Slow and steady wins the race" would apply here, I guess. I wish the stomach/abs was as quick as other areas. I love the way you refer to "us" as fluffy. You are looking great and congrats to tucking your shirt in. Huge accomplishment! We are fluffy and beautiful friend!! We got this!! AHHH i know exactly what you mean about never tucking a shirt in. in fact tonight i was trying on an outfit for a job interview this week and i had my blouse untucked after decided tucked in would look neater in an ideal world, but i wasn't willing to expose my fluffy bits. thanks for the inspiration Mary to love my body and own it 🙂 also your outfit looks so much more fab with the shirt tucked in! You got this girlfriend! You really do! Bring on the t-shirt!! Honestly, I didn't notice your "lower belly," until YOU mentioned it! I bet most people didn't either. Give yourself some credit girl, you look great!!! I think the tucked in look makes you look a lot slimmer. Try to be more gracious about your body, it has done wondrous things!